ww2dbaseCourtney Hicks Hodges was born in Perry, Georgia, United States to a newspaper publisher. He attended the United States Military Academy at West Point but did not complete the program due to his poor grades in mathematics. He instead enlisted in the US Army as a private in 1906, and became an officer in 1909. He spent some time in the Philippines and in Mexico before participating in WW1. He earned the Distinguished Service Cross for his services in WW1. With his outstanding record during WW1, he was invited back to West Point to teach, even though he dropped out of the academy years before. He became an Assistant Commandant of the Infantry School at Fort Benning and later the Commandant, in 1938 and 1941, respectively. Immediately before the Pearl Harbor attack that drew the United States into war, he held the rank of major general. ww2dbaseAfter the United States entered the war, Hodges was given command of the X Corps in 1942, and his responsibilities expanded in 1943 to include the US Third Army in 1943. 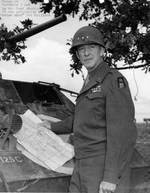 In Aug 1944, he became the commander of the Allied 12th Army Group. His troops were among those who liberated Paris, and played a critical role in foiling the German Ardennes offensive during the Battle of the Bulge. ww2dbaseHodges retired from the Army in Mar 1949 and passed away in San Antonio, Texas, United States in 1966. 5 Jan 1887 Courtney Hodges was born. 16 Jan 1966 Courtney Hodges passed away in San Antonio, Texas, United States.